Although life in Cambridge is wonderful, and I am equally in love with my friends and my work, sometimes I have to leave the bubble. 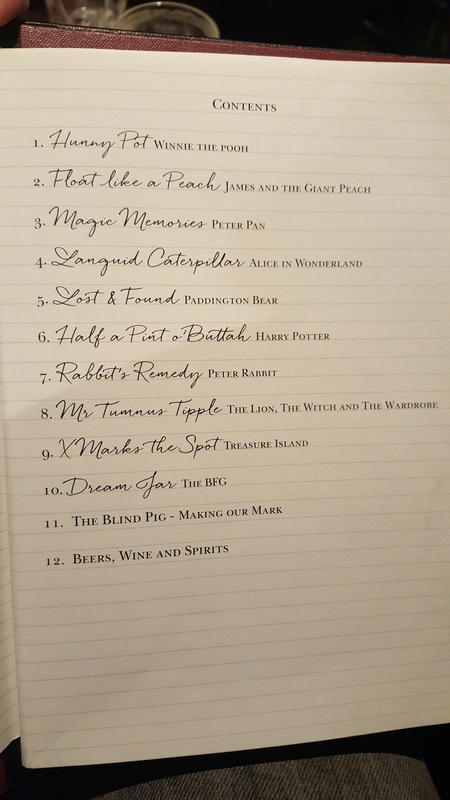 So after hearing about a secret cocktail bar in Soho with a children’s literature inspired menu, my partner and I figured we might as well go for a cheeky day trip. Lucky for us, the connection between Cambridge and London is very good, so as soon as we decided to go we found ourselves on a train. After a cold walk through London town, we made it to Poland Street, Soho. And walked straight past the entrance. We looked up the address again, and walked past the entrance once more. Slightly creepy, but pretty cool! We then went up several steps, both definitely oozing sophistication, looking suave, and not nervous at all, and arrived in a very swanky, very crowded bar. We were told there was only a standing space for us at the moment (turned out this really was 1 standing place for 2), but we’d be seated soon. Oh, and did I mention that this was at 3 in the afternoon? All of the nerves, the waiting, and people were instantly worth it when we were handed the menu. The menu is just as classy and cool as the place itself, beautifully illustrated in the style of a children’s novel. The lining is reminiscent of a primary school journal, and although this was all obviously focus grouped and highly stylized, it strangely felt organic and natural. Two things worked against us here: firstly, we are by no means cocktail experts and had not heard of a lot of these ingredients. Secondly, all of the cocktails sounded adorable and were illustrated appealingly beautifully. Making a decision was difficult. The presentation killed it and the drinks were delicious. Was it ridiculously expensive? Yes. Then again, this is Soho we’re talking about, so considering the costs of running the place I suppose we aren’t talking about extortionate pricing here. The strange thing to us was that while we were comfortably seated and taking our time to enjoy our drinks, the people around us appeared to come there to smash in one drink – within 10 minutes most of them would be gone. Because of the great connection to London it is so easy for a Cambridge student to escape the bubble, if only for an afternoon. 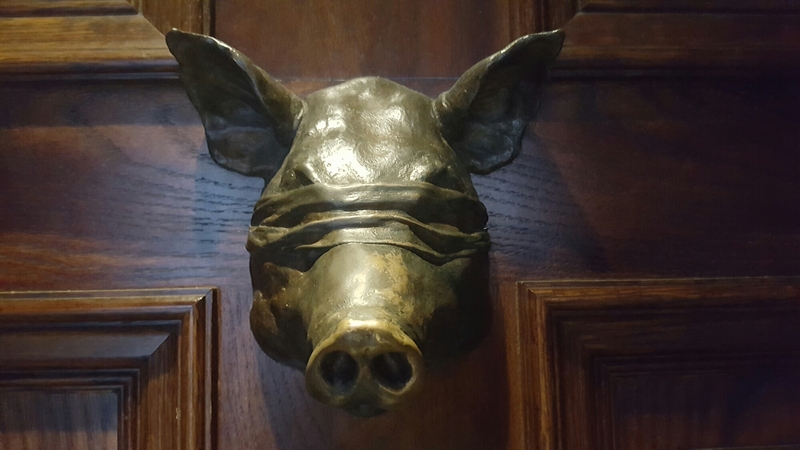 To all who have the same option, or who happen to be in London anyway, I highly recommend stopping by the Blind Pig. If you’re worried about spending that much on only a drink, I say to you: save money by walking from the station to Soho instead of taking the underground. You’ll be able to explore the city a bit, feel refreshed by a doable walk, and feel less guilty about treating yourself to a fancy, delicious drink! It’s okay to go on day trips too, though!